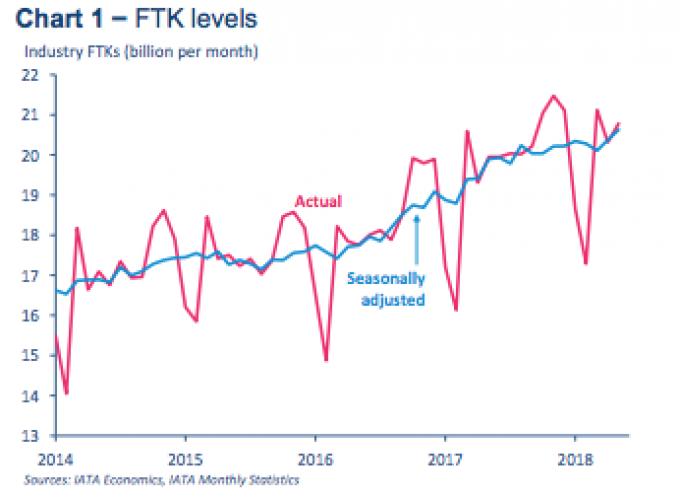 Last out of the gates to report May air freight data is IATA, which notes a “modest uptrend”. While growth in freight tonne km slowed to 4.2% in May, from 5.2% in April, seasonally adjusted FTKs picked up for the second consecutive month. However, it adds, while it would watch closely for signs of new demand, it remains relatively pessimistic. On the whole, it explains, the market is weakening; growth in capacity exceeded demand again, while May was only the second month in two years in which annual FTK growth lagged its five-year average pace of growth (5.1%). IATA has revised downwards its 2018 growth expectations, from 4.5% to 4%. The full picture is here.